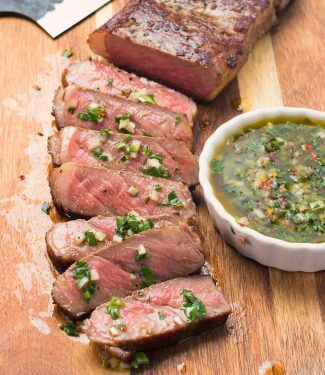 Steak with chimichurri sauce is a great way to add some zing to your every-day pan-fried or grilled steaks. It’s an Argentinian steak sauce brimming with olive oil, chili, garlic, lemon, parsley and onion flavour. It’s a totally different take on steak sauce. This post is more of a rant on the myths that seem to surround cooking steaks than a recipe. Don’t turn your steak more than once or the juices will run out. Don’t poke your steak or the juices will run out. And please don’t wear a yellow hat and face north on a Tuesday when cooking steaks or the juices will run out. Low and slow BBQ aside, the only thing that affects moisture in a piece of meat is internal temperature. Nothing else. This is science. Meat is made of protein. The more you heat a protein, the tighter the molecules get. The tighter the molecules get, the less room there is for water. The less water there is, the drier the meat becomes. It’s not a lot more complicated than that. Get an instant read thermometer and use it religiously. You will become a star of the grill, the roast, the chop, everything you cook. Cook your steaks to a target internal temperature of 123F for rare or 127F for medium rare. Let them rest – they continue to cook while they rest. 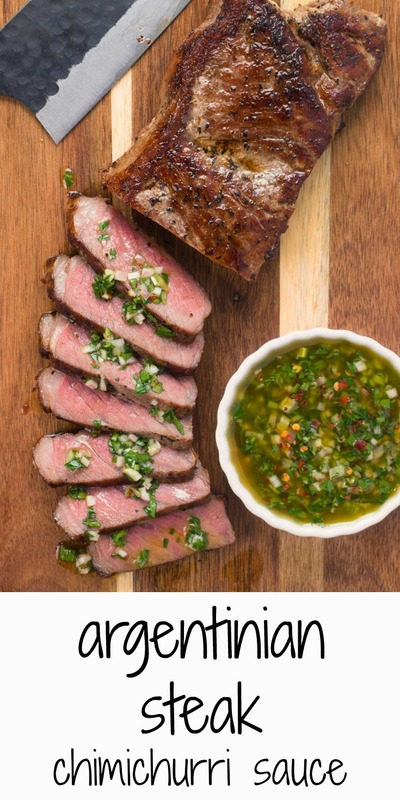 Do that and your steak with chimichurri sauce will be the talk of the next backyard BBQ. 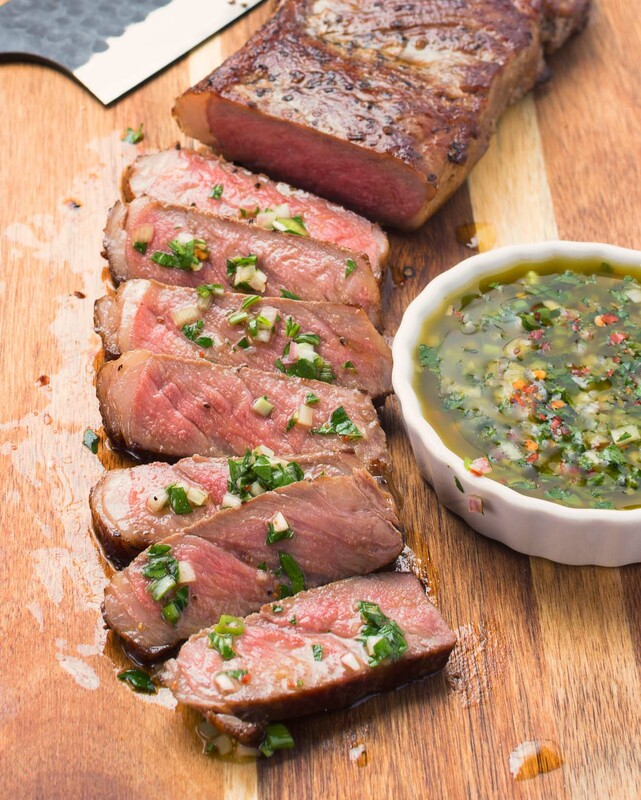 Steak with chimichurri sauce is a great way to wake up your every day steaks. 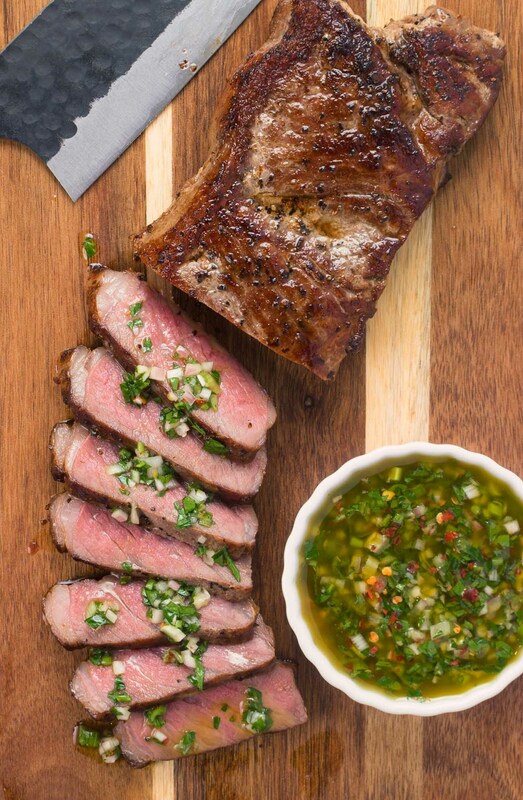 Make sure to make the chimichurri ahead of time to let the flavours combine. 4 10 oz good quality steaks Striploin or sirloin work well if you are pan frying - skirt or flank if you are grilling. This is really wide open. Season your steaks with salt and pepper. Build a two zone fire (or turn one side of the grill up higher than the other). Start your steak in the cooler zone for about one minute per side. Move to the hotter zone and continue to cook, flipping every minute or so, until your steaks are just under your target temperature. Remove, tent with foil and let rest 5 minutes before slicing. Pre-heat your pan over medium heat. Film with olive oil. Fry your steaks, flipping as required, for about 3 minutes per side for medium rare. Remove, tent with foil and let rest for 5 minutes before slicing. Cook your steaks sous vide for 2 hours at a temperature of 118F for steaks one inch or thinner. For steaks over an inch, cook at 123F. Remove steaks from the vac pac, pat dry and season with salt and pepper. Pre-heat a pan over medium-high heat. Film with oil. Your goal is to get a crust on the meat as quickly as possible without continuing to cook the steaks significantly. Flip as required. You are cooking for colour as the steak was already done when it hit the pan. One trick that helps the look of the steaks is to stand them up on end to brown the edges. Cover with foil and let rest 5 minutes before serving. In american, bbq and grilling, beef, main course, meat. Bookmark the permalink.